WASHINGTON -- President Trump announced Thursday that his administration would impose aluminum and steel tariffs beginning "sometime next week," according to Mr. Trump. The tariffs will be 10 percent for aluminum and 25 percent for steel, lasting for "a long period of time." "We'll be signing it next week," Mr. Trump said. "And you'll have protection for a long time in a while. You'll have to regrow your industries, that's all I'm asking." Stocks dipped by more than 500 points in the hours following the announcement, closing down 420 points to end the trading session. Plans for Mr. Trump to make an announcement were thrown into doubt amid internal wrangling over the decision. Some White House officials, including chief of staff John Kelly, were not fully briefed on the Commerce Department's plans, according to a senior administration official familiar with the process. This official was not authorized to publicly discuss the internal deliberations and spoke on condition of anonymity. Commerce Secretary Wilbur Ross and Treasury Secretary Steve Mnuchin sat opposite the president in Thursday's meeting. "There won't be dumping on our country. What they do is they dump massive amounts of product in our country and it just kills -- it destroys our companies and our jobs," Mr. Trump said. "Without steel and aluminum our country is not the same," the president said in the meeting. 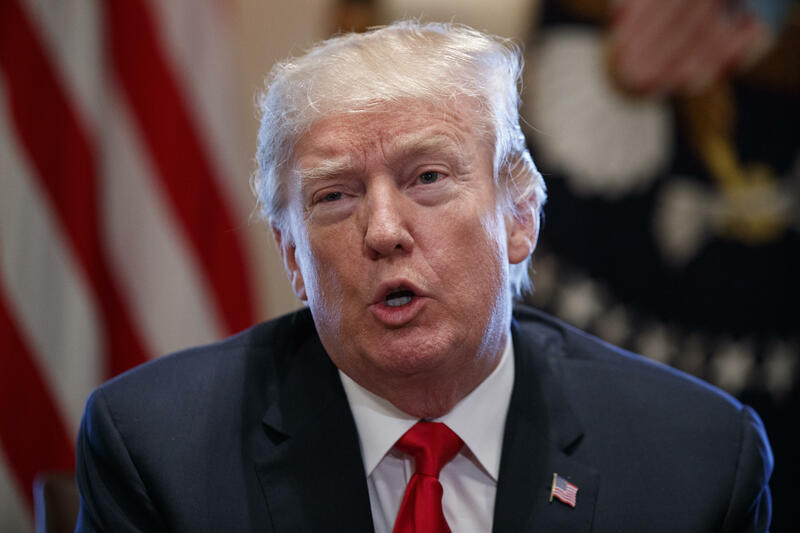 Trump tweeted Thursday that many U.S industries, including steel and aluminum "have been decimated by decades of unfair trade and bad policy with countries from around the world. We must not let our country, companies and workers be taken advantage of any longer. We want free, fair and SMART TRADE!" Mr. Trump last year ordered an investigation into whether aluminum and steel imports posed a threat to national defense. Ross said last month that the imports "threaten to impair our national security," noting, for example, that only one U.S. company now produces a high-quality aluminum alloy needed for military aircraft.